This weekend I had the opportunity to spend some time in the Taiwan Moonscape, the area of badlands in southern Taiwan. I had never seen the area up close and personal, merely ridden through it on a bike. One thing I hadn't understood was how big they were. The map below should give some idea of the extent of this 100,000 hectare formation which crops out as badlands in the area around Tianliao, with a thickness variously given as 3-4 kms (source), spreading across southern Taiwan from Chiayi to Kaohsiung. Mudstone formations are also found in Kenting near Hengchun and in Taitung. Walking around in the area naturally caused me to wonder: what was its origin? 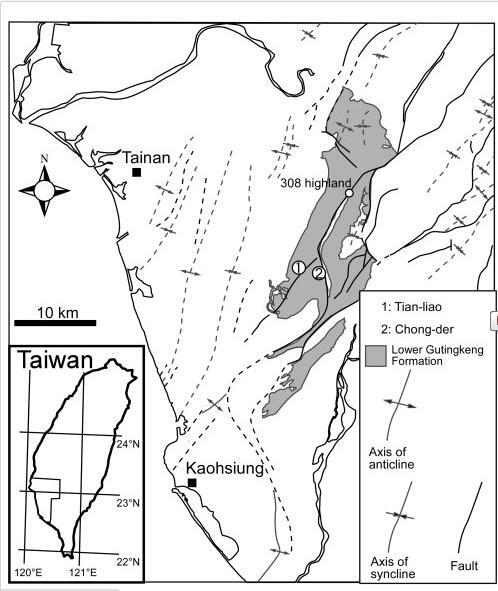 Extent of the badlands in southern Taiwan, the Gutingkeng Formation (source). Taiwan's badlands are unique, being the only badland formation on earth in a tropical area with good rainfall. The others in Italy, the US, and elsewhere, are all in arid or semi-arid regions. Badlands typically consist of weak sedimentary rock and fall into two basic types: calanchi, with pinnacles or sharp peaked ridges, as in Taiwan, and biancane, which are more rounded. The mudstone exposed in the foothills area of southwestern Taiwan is a sedimentary rock formed several million years ago (source). It is usually referred to as Pleistocene in origin. It is cut through with layers of limestone in places, which are quarried by Taiwan's ubiquitous gravel industry. The mudstone area is also the location of mud volcanoes, which track one of the region's major NE to SW running faults. At the famous hot springs site of Guanziling the hot springs crop out through this deposit of mudstone. The mudstone layer itself, as far as I was able to ascertain, is a deposit of marine sediments that formed during the late Cenozoic period (Pliocene/Pleistocene) as a giant sedimentary basin was gradually filled in with silt and clay and then uplifted to its current position by the action of the Philippine Plate. One interesting idiosyncrasy of these badlands is that the bare slopes are mostly south facing. The reason for this is solar radiation (source), not monsoon rains or typhoons as one might think. During the long dry season, the sun heats the slopes, making them inhospitable to vegetation, and causing them to crack, speeding weathering. The result is the south-facing bare slopes so typical of the badlands area. According to this article, because of the massive precipitation and sedimentation, the Erhjeng River, which drains the area of mudstone, yields 1.3 x 107 tons of sediment annually, the highest rate of sediment discharge in Taiwan. Great write up on the badlands Michael; especially the map of the area you found. I lived in Kaohsiung for over a decade before I really had a chance to explore them, but now cycle there regularly. I definitely want to get down there this summer to ride those roads.